One of the most common questions people ask before they go out camping is how to waterproof a tent floor? This is certainly a very important issue, since a wet tent floor will definitely put a damper on any camping experience. Camping dry for tent protection is absolutely essential. That's why learning how to waterproof a tent is so important. Is it Really Necessary to Waterproof a Tent? Many people assume that just because they have a tent, they will be protected from all the elements of the weather. This is not always the case. Even tents that claim to be waterproof can spring a leak, so it is always best to waterproof the tent before you go camping. The last place you want to be when you discover that your tent is not waterproof is caught in an intense rainstorm miles away from civilization. This cannot only be a discomfort, for the obvious reason of wet clothes and being cold, but you can actually catch hyperthermia and get very sick from sleeping in a wet tent. Some people don't think about waterproofing their tent, but doing so is certainly a good idea. Often times, people will go to extraordinary lengths to be prepared on their camping trip, including waterproofing hiking boots, but will forget or neglect to make sure the tent has been waterproofed. Just because a tent says that it has been waterproofed does not mean that every single inch of the tent is waterproof. The factory applies a waterproof seal in certain areas, usually the tent floor and the tent rain fly. The factory waterproof coating is not the best. It might work well in the beginning, but eventually the coating will wear out and the tent will start leaking or getting wet from the flooring. The factory sometimes waterproofs the bottom foot or so of the wall, but not always. When waterproofing a tent floor, it is important to remember to also waterproof the first two feet of the walls to ensure extra dry protection. So now that we know how important it is to waterproof the flooring of the tent, how exactly do we go about doing this? Well, the first thing we must do is purchase a good waterproof sealant specially designed for tents. The best place to find such a product is in a camping outfitter store such as REI or Campmore. Verify that the waterproofing product is specially designed for tents and camping equipment. Read the directions thoroughly before you begin applying the product. Many products will require that you add water or other mixtures before beginning. Once you have the waterproofing product all prepared, apply a coating or two on the flooring of the tent. Timing is absolutely crucial. Do not wait until the first coat is completely dry before applying the second coat, this will do nothing to add extra protection. Instead, apply the second coating while the first is still drying. If the weather is warm where you are waterproofing, the coating will dry faster. If it's very warm and you are coating a large tent, you might want to coat one half, then apply the second coating before proceeding onto the other half of the tent floor. The factory will almost always waterproof the flooring of the tent on the inside. Therefore, it is advised to waterproof the outside flooring. The factory coated side might leave a glossy appearance, if the tent is still relatively new and has not yet been exposed to many camping trips. Make sure that you apply the waterproofing material when the tent is completely dry. Just as paint will only stick to a clean, dry surface, waterproof coating will only hold fast on a dry tent. That's why it's too late to apply the coating when you're lying in the tent and begin to feel the rain coming down. Make sure that you do not dry the tent in a drying machine, as this can weaken the waterproof quality and overall durability of the tent. Place a ground cloth under your tent. A tarp underneath the tent can help prevent wear and tear on the waterproof coating. Always set your tent on higher ground than the surrounding areas. This will help the groundwater drain away from the tent and not toward it. If the floor is leaking, placing a tarp inside the tent can help keep the flooring more dry. Make sure you have a tent with a rain fly that provides good coverage. Pack raingear just in case all else fails. Always vent your tent to allow condensation to escape. 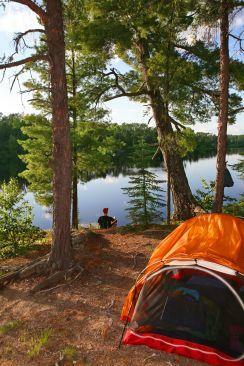 Always pack your tent dry to avoid mildew. Now that you know how to waterproof a tent floor, you should understand that proper maintnance is crucial to ensuring your tent floor stays dry. If you use the tent often you will want to waterproof the tent regularly.